We’d love your help. Let us know what’s wrong with this preview of SPIN Selling by Neil Rackham. To ask other readers questions about SPIN Selling, please sign up. There were a lot of awesome discoveries in the 80s, including, but not limited to, Big League Chew, the fact that long-haired men wrenching out soul-baring metal guitar solos would lead to multiplatinum album sales and the removal of countless bras so that they could be flung onstage, and the revelation that the process of selling majorly expensive goods or services was different from the process of selling, say, a PEZ dispenser. It is the concluding item on the aforementioned list that is, unfo There were a lot of awesome discoveries in the 80s, including, but not limited to, Big League Chew, the fact that long-haired men wrenching out soul-baring metal guitar solos would lead to multiplatinum album sales and the removal of countless bras so that they could be flung onstage, and the revelation that the process of selling majorly expensive goods or services was different from the process of selling, say, a PEZ dispenser. It is the concluding item on the aforementioned list that is, unfortunately, the focus of SPIN Selling (I say “unfortunately” because the first two items are of greater general public interest, I think). Despite the fact that this book is three decades old (leading to some fairly dated references), it contains some pretty valuable (if hopefully common sense) insight into large-scale sales that should be helpful to anyone wrestling with how to sell more effectively. Perhaps the most interesting takeaway is that while closing techniques (such as the alternative close, the presumptive close, and the no-clothes close (okay, I might have made one of those up, though let’s face it, that particular technique could prove optimal in certain situations)) are effective when you’re selling smaller items, they actually result in fewer sales when you’re talking about major purchasing decisions. If you think about it, that makes sense, right? On large purchases, not only are considerable resources at stake, but jobs are as well—if you’re the one in charge of, say, purchasing a new document management system for a large professional services firm and you pick a bad product/vendor, odds are pretty good that you’ll end up with a pink slip, whatever the heck that is (to paraphrase the late, great George Carlin, “I never got a pink slip…someone would just come by my desk and say, ‘GET THE F@CK OUT!’”). Instead of closing like crazy, Rackham’s research suggests a much more effective approach is to identify problems the customer is having, help them realize the potentially significant implications of those problems, and then propose a solution that addresses those needs. Again, it’s not advanced thermonuclear physics, but it does require a different mindset when approaching a client because it means listening and asking questions you may not have the answer to, which is not something people are always comfortable doing (especially when you’re used to simply trying to provide a solution whether it’s needed or not). One other interesting takeaway was Rackham’s perspective on the goal for a meeting in a large-scale sale: chances are it’s going to require multiple meetings to close a deal, so the goal shouldn’t necessarily be to close the deal in every meeting/conversation, but, rather, to conclude the meeting by taking the next step toward purchase, which might be getting a meeting with the next level of decision maker, getting a chance to demo a product or solution, etc. These insights are helpful regardless of whether you’re selling laser hair removal systems or legal services. Beyond that, there are very few jobs where some element of “sales,” broadly construed as meaning the act of persuading someone to agree to something and provide you with consideration in order to achieve that goal (whether such consideration is money, resources, time, etc. ), so even if you’re not a salesperson, this might be a helpful guide for thinking about how to better service your clients (whether they’re people inside of your organization or external companies). Full Review: What is Spin Selling? The subtitle of the book describes quite well what’s inside; “The Best-Validated Sales Method Available Today. Developed From Research Studies Of 35,000 Sales Calls. Used By The Top Sales Forces Across Th Full Review: What is Spin Selling? The subtitle of the book describes quite well what’s inside; “The Best-Validated Sales Method Available Today. Developed From Research Studies Of 35,000 Sales Calls. Used By The Top Sales Forces Across The World.”. If that isn’t enough, consider other sales books written by professional sales people, to be intuitive opinions on the sales process, rather than based on testing, optimizing, and results. In contrast, SPIN Selling uses data from thousands of calls, and sifts through them to determine if ‘closing’ techniques, and ‘situational openers’, etc, actually work. So, let’s break down what SPIN Selling actually entails. Need-Payoff Questions get the client to tell you the needs of a potential solution for them. Furthermore, the client ends up explaining the benefits of a solution, such as the one presented by the salesman. It’s less intrusive, and ultimately allows the client to present their important needs. One example was ‘obtaining commitment’ with specific actions from the other party involved. In this case, an actionable commitment is required, such as an additional meeting, or a request for a proposal, and does not necessarily mean a close. If an actionable commitment is not reached, then the likely outcome is a ‘continuation’ or a dead sale. Both of which lead nowhere. This is not going to be a normal review, these will be more of my notes to remember what I just read and become increasingly familiar with a new lexicon / jargon that is business speak. One quick annoyance, one quick whoa cool moment, then bullet points. This book costs $30 and you are done reading it in an hour. Why are business books so expensive and yet written at about a 3rd grade reading level? First though one thing I found rather interesting in reading this book is that it emphasizes the ri This is not going to be a normal review, these will be more of my notes to remember what I just read and become increasingly familiar with a new lexicon / jargon that is business speak. First though one thing I found rather interesting in reading this book is that it emphasizes the right way to ask questions and bring someone along an emotional sequence that is optimal for getting someone to do something you want. Basically, it teaches you to lead people along a certain emotional rollercoaster, to buy something at the end. Oddly, this is something that I’ve studied on my own, especially through reading Speeches that Changed the World. I noticed reading that book that there is a certain emotional trajectory that is best for getting people motivated. A careful mix of information, motivation, letting them talk, letting them listen, a careful emotional arch that when done correctly, is best suited for getting someone to do something at the end. I saw that throughout history, the circumstances changed but that emotional arch didn’t really change. The greatest orators and leaders pretty much followed it. So, I’m not shocked to see that it works in business either. It’s a different hustle, I’ve been told, but I think I’ll do all right in this game. OK, now the bullet point collection of facts. This book distinguishes between techniques that work best in small sales and larger sales, addressing mainly larger sales and pointing out that techniques which work in small scales are in fact detrimental in larger scale selling. A useful tip is preparing some of these questions before it’s go time. Need-Payoff Question – the happy cousin of implication questions. After you get them to hang their head and go “oh wow, it is really bad” you quickly build them back up by asking questions that lead them to tell you that “yeah, it would be a great fix. I then could do other important stuff!” Essentially it’s about the value, usefulness or utility that the customer perceives that your product can alleviate their problem. Demonstrating Capability – how your product works. Instead of explaining its features and benefits, a more effective technique is to address it through what problems it addresses. So you have to put yourself in the customer’s shoes and get a sense of their needs. Obtaining Commitment – at the last phase you should check you’ve covered their needs, summarize the benefits of your product, and propose an appropriate level of commitment. That last part is key, a call can be successful even if they don’t buy at that precise moment, so long as you get a bit further down the line through a concrete action (such as setting up a meeting or getting access to the next level of decision makers). Larger sales involve a series of meetings anyway, so they don’t have to buy for it to be a success. Think – could the customer repeat the presentation smoothly to his boss? With a larger value sale, you must build up the value of the product much more because customers become more cautious as decision size increases. Pressuring works in small sale, not larger sales. Whether you like it or not, all business involves sales in some capacity. Written in 1988, Rackham describes his findings from observing 35,000 sales calls over a period of 12 years. He outlines the sales format that most often led to long-term success (Situation --> Problem --> Implication --> Need-Payoff). The recommendations are authentic, powerful and helpful; this book is a must-read for anyone in business! 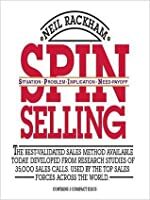 The first thing you have to realize about “SPIN Selling” by Neil Rackham is that it’s a book for selling to large accounts, written before anybody else was writing books about selling to large accounts. Yes Virginia, selling to large accounts is different than selling to smaller ones. To begin with, you cannot close the sale in one day, as a result opening the discussion by trying to closing technique is counterproductive. Besides, in major sales, the salespeople usually are not in the room when The first thing you have to realize about “SPIN Selling” by Neil Rackham is that it’s a book for selling to large accounts, written before anybody else was writing books about selling to large accounts. Yes Virginia, selling to large accounts is different than selling to smaller ones. To begin with, you cannot close the sale in one day, as a result opening the discussion by trying to closing technique is counterproductive. Besides, in major sales, the salespeople usually are not in the room when most of the important decisions are made. It’s the salesperson’s contact who needs to sell within her organization. It’s the job of the salesperson to arm his contact with enough information to make her an effective influencer. Like any good book on sales, Rackham has methodology, in this case a four step questioning process. In fact, the book gets its name from the four types of questions asked: Situational, Problem, Implication and Need Payoff. Rackham says the key to sales is understanding where you are in the sales cycle – he identifies The Preliminaries, Investigating, Demonstrating Capability and Obtaining Commitment – and only to asking the kinds of questions that get you to the next level because sales in large accounts follow a specific sequence over a long timeline. Situational questions set the context for asking Problem questions that reveal implied needs, like the desire for a more accurate billing system. Asking Implication questions about how many ways a more accurate would help the end-user’s company lead to Need-Payoff questions, which help the buyer focus on solutions and benefits. Speaking of benefits, Rackham notes that benefits come in two varieties: those that can help any customer and those that address your customer’s express need. He differentiates the two types of “benefits” by calling the former an Advantage and the latter is a real Benefit. Advantages help close small sales, while Benefits, which address explicit buyers needs, help land big deals. Yes, the book is dated. Written 1988, it doesn’t take into account that your customers already know a fair amount about your product from the Web. At least somewhere in the questioning process, you have to determine how much your customer already knows about your product, if only to dispel mistaken assumptions. Additionally, while the book is very strong on tactics, it mistakenly assume you will only sell to someone lower in the company’s organization. It does not provide tactics on how to use the SPIN method to move up the company’s organizational ladder, trying to get closer to the person who decides what projects get funded. All of that being said, nearly 25 years after the book was published it is still a foundational book on selling to large account sales. While the information available to customers has changed, the process for moving a customer through the sales cycle has not. When the book was released, readers found that its theories ran counter to conventional wisdom because it deemphasized closing techniques in large sales. At the time, most sales books focused on closing. Actually, most sales training focused on closing because, as Rackham points out, closing used to be the one place in the sales cycle that had an understandable and quantifiable result. But Rackham’s studies show that trying to close too early alienates professional buyers, the very person who is almost certainly on the other end of the sales call at a large account. Instead, the SPIN method relies on asking questions to tease out problems and help the client understand how the seller’s solution can tip the value equation to the buy side of the ledger. The foundation of the book is rests on research conducted by Huthwaite corporation’s 12-year $1 million research project into sales effectiveness, not just one excellent salesperson’s career experience This means the results of the book can be applied across a wide spectrum of businesses and industries, making a great starting point for learning about major account sales. Now on the other hand, if you want to read anything about closing the quick sale, let me point you to either Tom Hopkins or Zig Ziglar. It was such a drag to read this book that I am surprised that it only took me 2 months (including skimming through the last chapter cuz omg). This could be easily summarized into an A4 article and loose none of the insights. It took 100 pages to make an introduction to how cool they are. Only then they start talking about SPIN. Spin is asking different questions instead of only situational questions. Here it is. The key takeaway so far is that the sale can be short term (a chocolate bar for 2 eur) It was such a drag to read this book that I am surprised that it only took me 2 months (including skimming through the last chapter cuz omg). The key takeaway so far is that the sale can be short term (a chocolate bar for 2 eur) or long term (a printer with maintenance fees for 6000 euro). Higher cost requires different approach. You need to like a person that you buy from on the higher price range because you might need to see them again. Since I'm in the process of developing a new technology based company, this book provided excellent advice and strategies for selling my type of product. Thanks to Rick Larson and Joe Liblin for recommending it to me. This is the first sales book (not that I've read many) that I didn't want to throw across the room. Rackham's main advice boils down to, "Don't be a jerk." Why does this warrant a book? It runs counter to the training given to salespeople in large companies. For instance, Rackham found that using closing techniques a la the "Always Be Closing" mantra from "Glengarry Glen Ross" actually reduces sales when selling a high-priced item or service. It works for small-amount sales basically because the This is the first sales book (not that I've read many) that I didn't want to throw across the room. Rackham's main advice boils down to, "Don't be a jerk." Why does this warrant a book? It runs counter to the training given to salespeople in large companies. For instance, Rackham found that using closing techniques a la the "Always Be Closing" mantra from "Glengarry Glen Ross" actually reduces sales when selling a high-priced item or service. It works for small-amount sales basically because the person will buy the item to be rid of the annoying salesperson. But for a high-priced item, or sales that depend on a long-term relationship, closing techniques such as "So when would you like your new car delivered?" or "What color would you like, silver or blue?" just piss people off. The four stages of a sales call: Preliminaries, Investigating, Demonstrating Capability, and Obtaining Commitment. The last one is not a sale necessarily; the commitment advances the sale, and is the highest realistic commitment that the customer is able to give. (Meaning you have to understand your customer's position and buying process in their company.) An example commitment is having the customer and someone else from their company come to a demonstration. It's also important to distinguish between the customer's implied needs and explicit needs; the latter are more important. SPIN stands for four types of questions: Situation, Problem, Implication, Need-payoff. 1. Situation questions: successful salespeople don't ask many. Examples are "What equipment do you use now?" and "How many people do you employ here?" 2. Problem questions: not strongly linked to success in larger sales. Examples are "Is your existing machine hard to use?" and "Are you satisfied with ___?" This uncovers implied needs. 3. Implication questions: develop the seriousness of the problem; very important in larger sales, as they uncover more needs, which balances out the high price of the item/service. Examples are "You say ___. What effect does this have on your output?" and "It sounds like the difficulty of using this machine may be leading to a turnover problem with the operators you've trained; is that right?" One downside of Implication Questions is that they make people feel worse. 4. Need-payoff questions: builds up the value of the solution you are selling; very important because instead of you selling the customer on the benefits, they tell *you*. This reduces objections and rehearses them for the internal selling they have to do on a large purchase (selling their manager on it, for example). Examples: "You say you would like to control long-distance calling. Why is that important to you?" and "Would ____ be useful to you for cost reasons, or is there something else?" Seller: (Problem Question) You're getting too many mistakes? Buyer: (Implied Need) Well, no more than most offices, but more than I'd like. Seller: (Implication Question) You say "more than you'd like." Does this mean that some of those mistakes are causing you difficulties in documents you send out to clients? Buyer: Sometimes but not often, because I proofread all important documents carefully before I send them. Seller: (Implication Question) Doesn't that take up a lot of your time? Buyer: Too much. But it's better than letting a document go out with a mistake -- particularly if it's a mistake in the figures that go out to a client. Seller: (Implication Question) Are you saying that a mistake in the figures would lead to more serious consequences than a mistake in the text? Buyer: Oh yes. We could lose a bid, or commit ourselves to an uneconomic contract -- or even just come across to clients as sloppy. That's why it's worth a couple of hours a day proofreading when there's other things I should be doing. Seller: (Need-payoff Question) Suppose you didn't have to spend that time proofreading. What could you do with the time that you saved? Buyer: Well, I could give training to my office people. Seller: (Need-payoff Question) And this training would lead to improved productivity? Seller: (summarizing) So it seems that the present level of mistakes is leading to expensive retyping, which creates a motivation problem with your people. If mistakes, particularly in figures, get out to your clients, it can be very damaging. You're trying to prevent that at the moment by spending 2 hours a day proofing all key documents. But that's turning you into a bottleneck, reducing everyone's productivity and preventing you from putting time into training your staff. Buyer: When you put it that way, those mistakes in documents are really hurting us. We can't just ignore the problem -- I've got to do something. This is pretty long but I typed it out because you can see Ramit Sethi using all of these techniques in his sales copy. I'm very skeptical when it comes to business frameworks but this one is very solid, practical and useful - the great manual which shows how a big size sales should be done. One the one hand the book explains how deeply problems and their implications should be examined during the sales meeting, on the other hand, shows why many things which you heard about sales aren't applicable everywhere. If you work in the B2B sales, that framework would be very useful for you. If you are in a business where you sell anything that's a high value or complex sale(i.e something that is of a significant price and typically requires multiple meetings to sell), then you have to absolutely read this book. The first distinction is that small sales and complex sales are very different. Many sales book are written with smaller sales in mind. What works when you're selling a 100$ product is completely different than what works when you're selling a 10,000$ or 100,000$ product. Thi If you are in a business where you sell anything that's a high value or complex sale(i.e something that is of a significant price and typically requires multiple meetings to sell), then you have to absolutely read this book. The first distinction is that small sales and complex sales are very different. Many sales book are written with smaller sales in mind. What works when you're selling a 100$ product is completely different than what works when you're selling a 10,000$ or 100,000$ product. This book is meant for the latter type of sale, and is very thorough and covers most everything you'll need to know. The authors of this book have conducted thorough and detailed research with the sales departments of some of the world's biggest companies. Their findings are surprising but are scientifically based. Unlike many selling books, they aren't going of anecdotal evidence or what they think works. Their testing methodology is extremely thorough, and their Appendix goes through how exactly they tested their sales methods. Basically, they used a very scientific approach to creating their methodology. Their whole method is based on asking questions. According to their research, asking specific types of questions increases success in complex sales. Proper questioning is the major factor in increasing sales success in higher value sales. By asking the right questions, the customer realizes the gravity of the problem he's facing, and essentially sells himself on the solution(Your product or service). These questions are Situation, Problem, Implication, and Needs-Payoff Questions. I.e the SPIN Model. Situation Questions- They are basic questions about the situation the customer is in. You need to avoid asking too many of these as asking too many can result in a slight negative effect. Regardless these are necessary because you need to discover the customer's situation. Problem Questions- You are asking the customers what their current problems are. This is key as you're starting to develop the customer's needs. Implication Questions- This is where things start getting good. These questions basically take the problem questions, and delve deeper into them. For example an implication question would be, "You said your website is down around 1 or 2 days a month because of technical issues, does this result in less inbound leads contacting you because your website is down. Does the loss of those leads result in significant revenue loss?" You get the idea, basically you're showing how their problem has all these other implications which greatly negatively impacts their business. You are developing "explicit needs", basically the customer realizes that this problem HAS to be taken care of. Needs-Payoff Questions- These questions are where you ask a customer what the value of solving their problem is and whether it'd be useful for you to fix the explicit needs you developed through Implication Questions. With this question, they're basically selling your solution to themselves. There's a lot of detail in the book. The author debunks many common sales myths through his research, including the idea that you need to apply "hard closing" techniques(this is completely false, and can hurt your chances at closing the complex sale). Probably the only book ever entirely based on actual research and focused in larger sales. There are general techniques in selling—closing, handling objections, etc.—that work perfectly in small sales, but fail miserably in large ones. The author dissect the sales process into 4 categories: preliminaries, investigating, demonstrating capabilities, and obtaining commitment or closing. He shows how, in larger sales, closing is NOT the most important part of the process but Investigating. Said that, Probably the only book ever entirely based on actual research and focused in larger sales. There are general techniques in selling—closing, handling objections, etc.—that work perfectly in small sales, but fail miserably in large ones. Said that, he dissect the Investigating stage further into 4 types of questions you should ask to discover needs and build value in your clients' minds. - Situation questions: how does the actual situation of your client looks like? - Problem questions: are there needs, difficulties, dissatisfactions regarding this situation? - Implication questions: what are the consequences of such problems? Go beyond the obvious and search for every single seemingly unrelated problem that can add value to your offer. - Need-payoff questions: "now I can talk about your solution, right?" Not exactly. The author suggests you ask questions so that the customers themselves tell you the benefits of your solution. This is way more powerful than claiming them yourself. Mastery the last two will give you an edge selling high-ticket products and services. Aside form The Book Of Mormon, This book has had perhaps the greatest impact on my career and my role as a father. This book was first recommended to me by a colleague by the name of Matt Fowler. As a side note, Matt's decision to hire me was one of the most significant career events of my life. This is by far the best book I have ever read on question based problem solving. If you read this book, you will probably want to purchase the SPIN Selling Field Aside form The Book Of Mormon, This book has had perhaps the greatest impact on my career and my role as a father. If you read this book, you will probably want to purchase the SPIN Selling Field Book as well. REMEMBER: The key to understanding and applying the SPIN process is NOT knowing exactly what questions to ask. In other words, you don't need an arsenal of questions that you draw on like ammo in a fire fight. although having a few good ones in your pocket can be helpful for certain situations. Yes, this is a sales book. But it is a sales book about not being a creepy salesman. The basic jist is that small sales involve shysterism -- and give salespeople a bad name. Consider what it used to be like to buy a TV at Circuit City, where the salespeople operated on commission -- high-pressure, low enjoyment. But then there is the whole category of large sales, such as selling a large IT system or consulting engagement -- where the “salesperson” is going to meet with the customer many times Yes, this is a sales book. But it is a sales book about not being a creepy salesman. The basic jist is that small sales involve shysterism -- and give salespeople a bad name. But then there is the whole category of large sales, such as selling a large IT system or consulting engagement -- where the “salesperson” is going to meet with the customer many times over the course of several days or weeks, and in which there are multiple stakeholders with multiple agendas. In these large sales, there is a whole different approach that this book spells out -- and it is a much more collaborative, respectful, mutual problem-solving approach that makes sales seem a lot more respectable than my previous stereotypes of it. This would also be a good book for anyone who is trying to fundraise large amounts. For people who are keen to improve their skills in selling, this is one book that I will highly recommend. This is because, the content of the book comes from comprehensive research by the author's company. And like all wise researchers, the author advises the reader to take some of his pointers with a pinch of salt, because he is not able to say conclusively "This is it! Follow this and you'll sell". Rather, he tells you that "This is what we found and PROBABLY will be helpful, but because we c For people who are keen to improve their skills in selling, this is one book that I will highly recommend. This is because, the content of the book comes from comprehensive research by the author's company. And like all wise researchers, the author advises the reader to take some of his pointers with a pinch of salt, because he is not able to say conclusively "This is it! Follow this and you'll sell". Rather, he tells you that "This is what we found and PROBABLY will be helpful, but because we couldn't take this out and experiment in a meaningful manner, we think you should apply it carefully." This is truly the *only* sales book out there that relies on actual data and methods that are scientifically valid. We got everyone in the company a copy of this book. It’s also the only book that I go back to daily since I read it. Very well written and impressively well researched. I found most non-fiction books lacking in structure, but SS is organized in a very logical and easy to follow way. It’s nothing but a testament to Rackham’s strengths as a thinker and a researcher. Do yourself a favor and trade it in for The Solution Selling Fieldbook. This process is disengenuous and antiquated and people now see through it. I recommend this book frequently! I love the methodology he uses for asking questions that keep going deeper. This is a great method for selling anything -- including your own skills and abilities! amazing. i hear it's one of few that's backed by research and numbers instead of just anecdotes. learn this and you're set to sell. 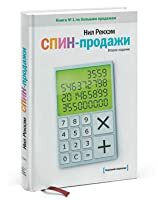 Отличная книга от предпринимателя и исследователя в одном лице. An enlightening approach to large sales that require multiple interactions. Success in such sales requires a different methodology than small sales that usually take one interaction. In a large sale, you must build the customer's perceived value of your solution, and the most effective way of doing that is to ask the right questions. The book is based on 10 years of observing and analyzing over 35,000 sales transactions. As the author explains, "We've put thousands of sales calls under the micros An enlightening approach to large sales that require multiple interactions. Success in such sales requires a different methodology than small sales that usually take one interaction. In a large sale, you must build the customer's perceived value of your solution, and the most effective way of doing that is to ask the right questions. The book is based on 10 years of observing and analyzing over 35,000 sales transactions. As the author explains, "We've put thousands of sales calls under the microscope to isolate some of the detailed behavioral elements that bring success to the major sale." I read this because it was recommended in the uGurus course Web Design Sales Kit. I took the course as part of the uGurus $10K Bootcamp, which I highly recommend. uGurus recommends a sales process based on the SPIN Model. I handle sales for my web design agency, OptimWise, which is why I enrolled in Bootcamp and read this book. Most important skill: building perceived value. The larger the sale, the more the salesperson factors into buyer's decision, because they're buying an ongoing relationship. Buyers fear making a mistake others will know about. This fear may be more important than fear of spending a large amount. 2. Investigating: finding out facts, info, needs. Ask SPIN questions. Investigating is most important of 4 stages. The more questions, the greater the chance of success. Doesn't matter if questions are open or closed; what matters is if they're about an area of importance to customer. Closing techniques reduce chances of making sale. An Advance is when call moves sale towards a decision, and makes the call a success. A Continuation is when customer doesn't say no but doesn't commit to an action that moves towards a decision, and makes the call a failure. Build needs during investigation, causing customer to realize they have an urgent need to buy. At end of call, summarize key points and benefits to customer. Explicit, not implied, needs are key to sales. Uncover implied needs and develop them into explicit needs through questioning. Purpose: learn facts and background of customer's situation. Ask as few Situation questions as possible. Find out as much as you can on your own. Example Situation questions: What equipment do you use now? How many people do you employ here? How old is this unit? Purpose: explore customer's problems, difficulties, dissatisfaction. Problem questions are more strongly linked to success then situation questions , but still not strongly linked to success. Example Problem questions: Is your existing machine hard to use? Do you have quality problems? Are you satisfied with X? Purpose: explore effects or consequences of problems. Implication questions are strongly linked to success. They build up customer perception of value. Example Implication questions: What effect does that have on output? Could that lead to increased costs? Will it slow down your proposed expansion? "Implications are the language of decision-makers." Implication questions are particularly powerful in high-tech sales. Implication questions are problem-centered and can make customers feel negative or depressed about their problems. Purpose: get customer to tell you benefits your solution could offer. Need-payoff questions are strongly linked to success. Need-payoff questions are particularly effective with influencers who will present your case to decision maker, because they think in terms of how solution will help, not about product details. Example Need-payoff questions: How would that help? Why is it important to solve this problem? What benefits do you see? Need-payoff questions are solution-centered, positive and helpful, making them good for sales to existing customers. Need-payoff questions get customer to tell you how your solution will help, which reduces objections and makes your solution more acceptable. 1. Ask Situation Questions to establish a context and background facts. Don't ask too many, because they can bore and irritate the buyer. 2. Ask Problem Questions to explore problems, difficulties, dissatisfactions, so that the buyer reveals Implied Needs. 3. Ask Implication Questions which make the buyer feel the problem (Implied Needs) clearer, larger, and more urgent. 4. Once buyer agrees that problem is serious enough to justify action, ask Need-payoff Questions to get buyer to state Explicit Needs, focus on solutions, and describe Benefits your solution would bring. Plan Implication questions before call. Write at least 3 problems buyer may have, then write questions that would uncover them. When customer raises need you can meet, ask Need-payoff question; don't skip to talking about solutions. Talking about Benefits is more effective than talking about Advantages. Benefits show how a product meets explicit need customer expressed; Advantages show how product or features can be used or can help customer. Features raise price concerns; Advantages raise objections; Benefits bring support or approval. The more objections you get, the less likely you are to be successful. It's best to prevent them. Avoid opening with personal interest unless buyer raises subject. I have spent many unnecessary minutes on books written on a blemished premise. They usually start with their own story of how they failed and then miraculously "invented" a way to make billions. The result is usually a book that is 200 pages in length but in truth should have been just 20 pages long. SPIN Selling is no such book. SPIN Selling is a sales methodology book for those who work in companies that make large B2B sales. If the value of your product or service is small, you can carry on wi I have spent many unnecessary minutes on books written on a blemished premise. They usually start with their own story of how they failed and then miraculously "invented" a way to make billions. The result is usually a book that is 200 pages in length but in truth should have been just 20 pages long. SPIN Selling is no such book. SPIN Selling is a sales methodology book for those who work in companies that make large B2B sales. If the value of your product or service is small, you can carry on with what you have been told in any other book or sales training. By fleshing out a coherent methodology of asking the right question at the right time, borne out of a large amount of research, this book teaches how to make sure you have a high percentage of winning whenever you make a sales call. SPIN stands for Situation, Problem, Implication and Need-Pay Off questions, which is the sequence in which those questions need to be asked. My favorite introduction to high-end, solution-based selling. If you put "stereotypical used car salesman" on one end of the spectrum (one-time, win/lose, asymmetric information, no reputation), this is the other end of the spectrum. Some of the later books (Major Account Sales, especially) develop this concept better, and there has been a lot of work around team-based sales organizations since this book was written, but it's still fundamental. One of Moliere's characters says in "Le Bourgeois gentilhomme": "Good heavens! For more than forty years I have been speaking prose without knowing it.". That's how I've felt when reading this book. This book sums up about half of my objections toward classical sales training approaches. If I've trained you you will find it pleasantly familiar. Treat is as a synthesis opportunity. If you are selling high ticket items, products or services in a B2B environment - this is a book for you. Do your rev One of Moliere's characters says in "Le Bourgeois gentilhomme": "Good heavens! For more than forty years I have been speaking prose without knowing it.". That's how I've felt when reading this book. This book sums up about half of my objections toward classical sales training approaches. If I've trained you you will find it pleasantly familiar. Treat is as a synthesis opportunity. If you are selling high ticket items, products or services in a B2B environment - this is a book for you. Do your revenue forecast a favor and buy it for your salespeople. I will make sure my sales consultants read it ASAP (those that didn't yet). Scientific proven tips to increase sales dramatically. The tips are aimed at high ticket sales, where you have several meetings etc. 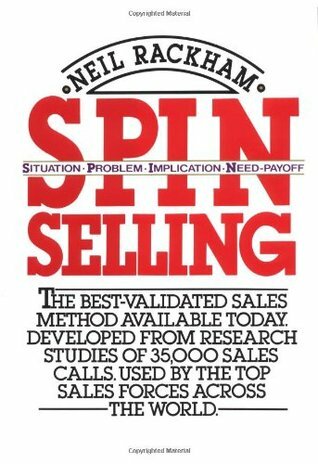 Neil Rackham’s classic book, SPIN Selling, is a sales how-to book. By closely examining over 35,000 sales calls, he shows a correlation between asking questions and the successful sale. He calls the model S.P.I.N. This acronym represents four different types of questions: Situational Questions (i.e. "How old is this unit? "), Problem Questions (i.e. "Is your machine hard to use? "), Implication Questions (i.e. "Could that lead to increased costs? "), and Need-payoff Questions (i.e. 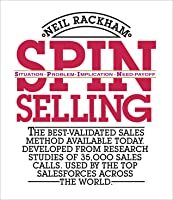 "Why is it impor Neil Rackham’s classic book, SPIN Selling, is a sales how-to book. By closely examining over 35,000 sales calls, he shows a correlation between asking questions and the successful sale. He calls the model S.P.I.N. This acronym represents four different types of questions: Situational Questions (i.e. "How old is this unit? "), Problem Questions (i.e. "Is your machine hard to use? "), Implication Questions (i.e. "Could that lead to increased costs? "), and Need-payoff Questions (i.e. "Why is it important to solve this problem?"). One of the main objectives of the author was to dispel the myth of closing techniques. He shows, through his research findings, that closing tactics are, in fact, effective in less complicated sales but actually detrimental in large sales. And many other helpful insights. If you have a strong foundation in sales, I would suggest reading this book as a way to cement your understanding of the importance of asking good questions and as a guide to improve your questions. I would not recommend it to someone that is looking for a complete sales training all in one place. For example, the S.P.I.N. system stops short of encouraging a sincere desire to understand, listen and to serve others in a way that is necessary to build trust and long-term relationships. However, the empirical data in the book is very effective at showing the importance of asking good questions. If you think asking questions is only something you do before and after a sales presentation, this might be the book you need. his book was highly recommended, and I can't for the life of me understand why--it's dated, poorly written, and Mr. Rackham needs a new editor. This is more a book about Mr. Rackham and his research (complete with dot matrix charts and graphs!) than it is a book about new ways to bring customers into your organization. Maybe I'm just a skeptic, but a book that relies solely on a single source of data should be viewed skeptically. More so when the single source is the author and when the author s his book was highly recommended, and I can't for the life of me understand why--it's dated, poorly written, and Mr. Rackham needs a new editor. This is more a book about Mr. Rackham and his research (complete with dot matrix charts and graphs!) than it is a book about new ways to bring customers into your organization. Maybe I'm just a skeptic, but a book that relies solely on a single source of data should be viewed skeptically. More so when the single source is the author and when the author says "my way is really the only successful way to do a thing." More to the point, this may have been "new" in the 80s, but it just seems like common sense to me. Ask questions, but not so many basic questions that you seem annoying. Lead the customer down the path to a sale with more probing questions that force the potential buyer to articulate the benefits of your product for you. Etc., etc., etc. This review has been hidden because it contains spoilers. To view it, click here. Even though this book was released when computers had monochrome monitors and people wore calculator watches, this book is just as relevant today as it was back then - perhaps even more so with the rise of intangible products and services like SaaS. SPIN Selling focuses on how to sell B2B for major or large sales. If you are the purchaser and buy your company a stapler, photocopier or even a vehicle - the risk associated with it can be rather low. However, implementing the wrong $500,000 software Even though this book was released when computers had monochrome monitors and people wore calculator watches, this book is just as relevant today as it was back then - perhaps even more so with the rise of intangible products and services like SaaS. SPIN Selling focuses on how to sell B2B for major or large sales. If you are the purchaser and buy your company a stapler, photocopier or even a vehicle - the risk associated with it can be rather low. However, implementing the wrong $500,000 software solution for your company could cost you your job. Buyers in these situations are necessarily hesitant, and so a different approach is required for selling to these customers. S.P.I.N. is an acronym that breaks down the questions to be asked during the sales process. S) Situational Questions are data gathering questions asked at the beginning of the conversation to help understand your prospect. This is when you would determine who the decision maker is, when the buying window opens, whether they need a product (or service) like yours, and so on. This clarifies how the organization makes decisions so that it is easier to determine whether the customer is a good fit and how to approach the sale. P) Problem Questions identify what pain points the customer is having, and your job is to see if your solution can meet their needs. 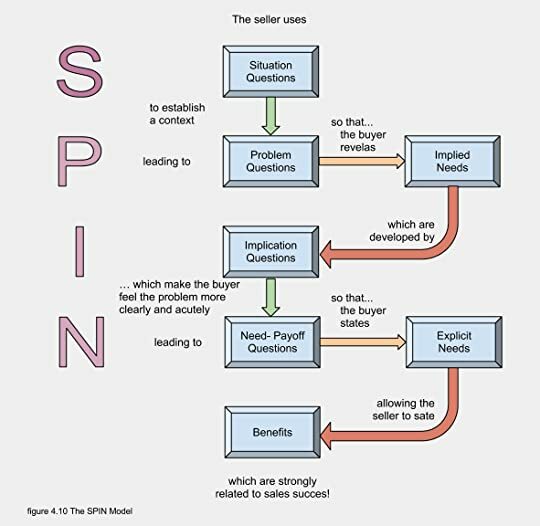 Situational and problem questions are used in sales already, but while low performing sales people start talking about the advantages of their products and start "selling", the SPIN selling model identified that high performing sales people kept asking new types of questions which you’ll read below. I) Implication Questions are when you ask what their (problem question) responses imply for the rest of the organization. For example, if you sell a piece of equipment that costs $120,000 and the only issue it solves is that the current equipment is too slow, then they will reject your offer. By asking implication questions the buyer might reveal that the current equipment causes bottlenecks in production, is difficult to train people on, and leads to high turnover and retraining. As such, the problems of using the old equipment is much greater in the buyer's mind and they are more prone to consider solutions. Tip: After they have discussed some implications, ask them whether it impacts any other areas of the organization as this will continue to uncover other needs that your solution can fix and “grow the customer’s need”. N) Needs-Payoff Questions are questions that get the buyer to tell you about the benefits your product offers to their company. Getting the buyer to answer these questions is very important because the buyer (not necessarily you) will be the one selling your product to the rest of the people in the company who have the authority to approve or kill your deal. Tip: As they share benefits of your product, ask how else it can solve their problems to increase the perceived value of the product and sell them on it themselves. There were three other items that were very informative and I would be remiss to not share them with you. The 4 categories of sales call outcomes are: Orders, Advances, Continuation, and No-Sale. Neil argues that if it is not an Order or an Advance then the call should be deemed a failure. Continuations mislead many sales reps because the positive noises from the buyer at the end of the call or presentation are misinterpreted as Advances when they are actually politely brushing you off. If there is no clear action that moves the sale forward to a decision, don’t confuse this as being an Advance. Implicit Needs vs. Explicit Needs: The difference between these customer statements is that implicit needs shares what their problems or frustrations are, whereas explicit needs vocalize that they have a need. (i.e. “I need a product that is faster than our current model). Too many sales people start selling when they hear implicit needs, but only when they start hearing explicit needs has the buying signal been given to you. Statistically, they found that the more explicit needs that he buyer gives the more likely they would buy in the end. Preventing Objections: Their research found that poor salespeople invited 10x as many objections than great salespeople did. Although it is impossible to eliminate all objections, by focusing on the benefits that the product provides to your customer’s problems, versus advantages your product offers, there will naturally be less objections raised because you are addressing their needs instead of selling them on features of a product they might not want. If you’ve read this book before, what did you find helpful about it? How has it changed your business and life in sales? Please comment below. excellent introduction to the science and art of selling. for those of you (like myself) who career seemingly has NOTHING AT ALL to do with the art of the sell, and/or whose exposure to salesmen are limited to cars, or stores in the mall, or phone solicitors, or the guys in the movie Glengarry Glen Ross, this book will come as a welcome surprise.